Let's kick off the holiday season with one of my favorite holiday throwback polishes! 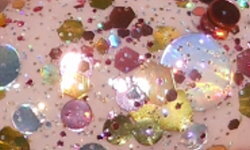 This one is by KBShimmer and it's really the perfect glitz and glam party color for this time of year. This is a glitter topper polish and I know glitter toppers have lost their appeal significantly over the past year or so. That being said, I think they're great to break out in the holidays because there is no better reason for bling in my opinion! Toast-ess With the Mostest is a clear base with gold, silver, and pink glitters in various sizes and shapes. Color: I love this pink, silver, and gold color combination. It's a festive and fun color combination yet sophisticated as well. The mix of glitter shapes in this polish is fun and unique. Remember when circle glitters were a thing? This reminds me of some bubbly champagne! Formula: This formula was fairly easy to work with it. It works better to dab these glitters on. I used one coat dabbed over a base. Price: N/A. This color is no longer available. I did request it as a returning color in KBShimmers FB group a few months ago to no avail. I tried! Overall: This is an excellent fun and festive glitter for the holiday season! I love these colors and I wish this polish would make a comeback!